It’s getting worse ev’ry year! When you are a mother in charge of a family, every day is fraught with perilous dilemmas and burning questions that only you, through your amazing wit and marvelous ingenuity have the wisdom to solve. You, as a mother, are required to crack mysteries and solve riddles that are so tough, so astounding, and so mind boggling, they would catapult even the most exceptional detective mind into everlasting lunacy. No amateur mind could solve riddles such as these startling questions you face every day: How did your husband’s underwear get in the freezer? Who stuck spaghetti all over the cat? What happened to the Thanksgiving turkey that was sitting on the table a few minutes ago? If your son didn’t go to the bathroom in the potty, where did he go to the bathroom? And last but not least, how in the world can you get ten children bathed, brushed, and ready for church in less than ten minutes? This was the burning question facing me during a visit to my sister-in-law’s house after we woke up late one Sunday morning. My sister-in-law is your basic nervous person. This is unfortunate because I am allergic to nervous people. The allergic reaction I have doesn’t make me sneeze, it makes me suddenly calm, as if nothing in the world matters, especially not being late for church. The more nervous my sister-in-law became, the slower my heart beat until I had to check my breathing to make sure I was still alive. I won’t continue to quote the chapter. Suffice it to say that things do not go according to plan (A seventh character may suddenly join the six kids in the tub, and its name starts and ends with p.). Let’s talk about the writing nitty-gritty, shall we? Campbell’s writing is wonderfully wry and also highly visual. The events in each vignette are described so vividly that the reader is immediately drawn into the story, as if he or she is actually a nosy neighbor who was disturbed by the commotion next door and so decided to pop in to make sure everything was okay—and then decided to pop right back out again, because while things were obviously not okay, no one was in immediate mortal danger. 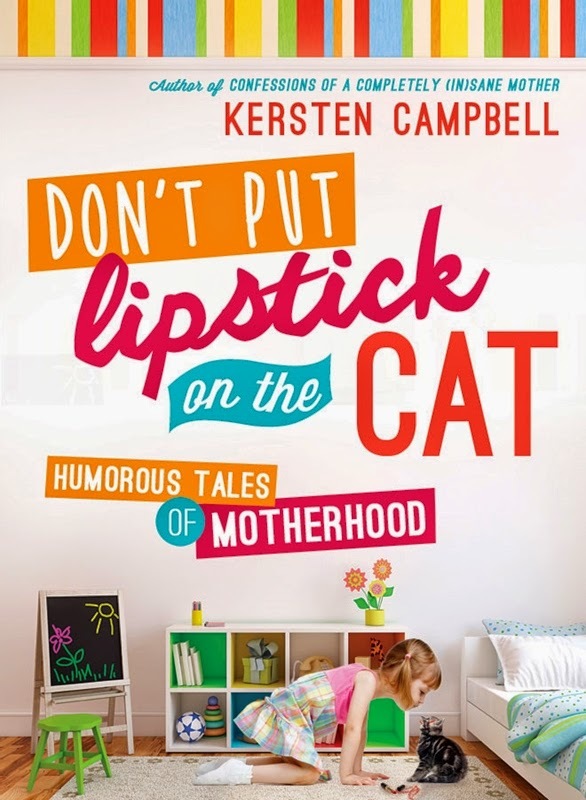 Although Don’t Put Lipstick on the Cat is based on Campbell’s real-life experiences, she uses made-up names for each of her characters. This not only protects the identities of the (ahem) innocent, but it also allows Campbell to get at the personalities of her characters without making extensive explanations for their behavior. “Scoot,” for example, has a knack for scooting out of the trouble his antics frequently get him into. 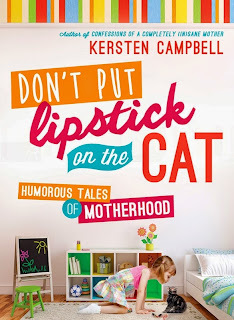 Another thing worth noting: The Library of Congress Cataloging In-Publication Data lists this book’s topics as “Families—Humor,” and “Mormon Families—Humor,” but the hilarity that ensues in each chapter of the book is something that everyone can relate to—particularly if the reader has ever tried to run a self-propelled lawn mower or has had a kid in violin lessons, that is. The vignettes are reminiscent of those found in Please Don’t Eat the Daisies, by Jean Kerr and Cheaper by the Dozen, by Frank Bunker Gilbreth, Jr. and Ernestine Gilbreth Carey. They celebrate family life and motherhood and would make the perfect gift for Mother’s Day—which is only a week away! It’s available in paperback or in a Kindle edition.